The Agape Café serves a free, hot, made-to-order breakfast to our neighbors experiencing homelessness and/or food insecurity. We are open every Wednesday from 7 - 8:30 am during the academic year. At Agape Café’s weekly breakfast, we strive to create an environment that provides, along with a healthy and delicious meal, the equally fundamental needs of being treated with dignity and respect. Our volunteers serve our patrons in a restaurant-style setting, which not only allows our guests to order exactly what they want, but creates an atmosphere of dignity and humanity. We believe that this positive breakfast environment is just as important as the quality of the meal. Agape Café is currently in its 26th year of operation! Over the years at Agape Café, we have been open for over 800 mornings, with up to 100 guests served per morning. That’s over 50,000 plates of free, cooked to order food! We think that’s pretty amazing. Our ability to serve these breakfasts is sustained by the donations from Iowa City’s community and the countless volunteer hours provided by our awesome volunteer staff. See U of I academic calendar for rough dates; and you can double check if we are open at our Facebook page! 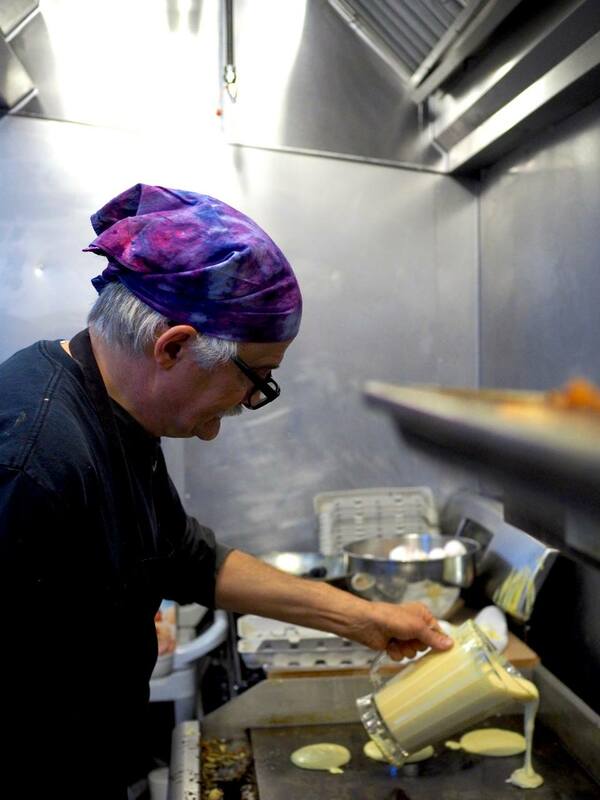 Agape Café is made possible by the tireless work and enthusiasm of its volunteer staff, from the cooks to the servers, and set-up and clean-up crews. We work hard to make the café run as smoothly as possible and an environment of respect, dignity, and freedom— and that takes a lot of volunteers! If you are interested in volunteering with Agape, head over to our page on Volunteermatch.org to see what positions are currently available! We generally prefer a weekly or every-other-week schedule, and a 1 semester minimum commitment. Volunteer with us! You won’t regret it! Agape Café is a nonprofit organization, and operates entirely on the support of our local community and other local organizations. If you are able to contribute to our weekly breakfast, please consider doing so! 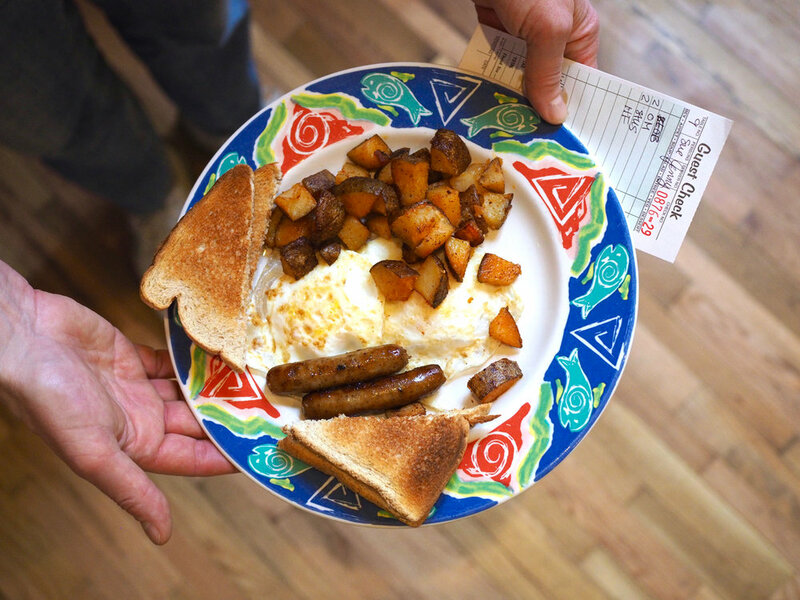 Your money goes directly to purchasing groceries for breakfast every week and maintaining the kitchen at Old Brick. A full house at Agape Café 2018 Fundraiser! The majority of our funding comes from our Annual Fundraiser. This year’s fundraiser is on Saturday, April 13, 2019, and we’d love if you could make it! Come down to Old Brick between 8 am and noon to enjoy our classic Agape breakfast, listen to some good music, and hang out with your local community. 2018 Fundraiser: agape celebrates 25 years! Last year’s Agape Café fundraiser marked the 25th year of operation for the café. Over the years at Agape Café, we have served over 800 free breakfasts, with up to 100 guests served per breakfast. For any questions regarding Agape Café, you can reach us using the form below or by directly emailing agapebreakfast@gmail.com.